Inspired by fashion and driven by innovation! Sebastian has been an iconic hair care and styling range in Australia for the last 30 years and a game changer for anyone who wants to recreate luscious salon hair at home. Behind every amazing stylist are amazing styling products and we’ve put together a list of essential style items. The original wearable styling conditioner. Potion 9 is a style-care hybrid used to create gorgeous, naturally conditioned styles without compromise. The ultimate versatile styling cream infused with 9 Botanical extracts to restore lost moisture and rejuvenate your hair. 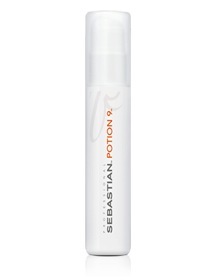 Potion 9 is a styling product that can be used on wet or dry hair and layered with other Sebastian styling products to refresh, texturize and create and immediate style boost. nourished curls and waves to perfection for a super conditioned air-light bounce. 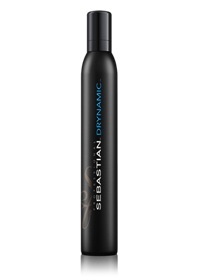 Dispense evenly and blow dry for a tousled bounce or set for glamorous curls. Whipped crème delivers unrivaled protection and shine without the crunch and dull build up. Hair dryers, curling irons and hair straighteners deplete your hair of natural oils and destroy essential proteins in the hair shaft. Trilliant is a shimmering thermal protection spray designed to provide essential heat protection on all hair types and is absolutely critical for anyone using heat styling tools. Trillian works by forming a protective barrier over the hair strand preventing damage and keeping your hair nourished and hydrated. For stunning body and brilliant shine, spray on damp hair before blow drying for heat protection, sparkling flashes and smoothing shine. Monday morning is traumatic enough without the added time killer of washing and drying your hair. Drynamic has been labeled the ‘next generation dry shampoo with benefits, letting you prolong the life of a bouncy blow dry or create your way to fresh hair. An aerosol spray that absorbs excess oil form the scalp with it’s breakthrough formula that instantly refreshes hair, adds texture and recharges the hair’s stylability. If you would like to know what Sebastian product is right for you contact us for a personalised complimentary consultation. If you know it already book now and our amazing staff will see you soon.